Applications: Specifically designed to meet the nitrogen and dry air needs to supply a Microwave Plasma Atomic Emission Spectrometer (MP-AES) of the Agilent range. 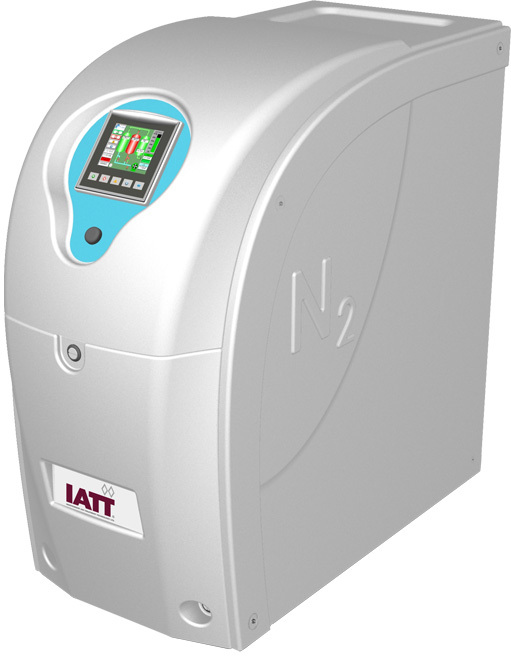 These dual flow AiroGen® Nitrogen/Air Generators from IATT produced by Pressure Swing Adsorption (PSA) to remove O2, CO2 and water from compressed air. Purified air is produced by using an activated alumina column. The generator provides two continuous streams of Nitrogen and dry air from a single ‘Plug and Play‘ unit. The model is available with an integral oil free air compressor and is extremely quiet in operation. The Nitrogen/Air Generator is controlled using the latest in HMI touch screen technology to display the process in real time for inlet/outlet pressures. Complete ‘Plug and Play’ system specifically designed for the Agilent MP-AES. Available with or without built-in-air oil free compressor with noise reduction technology. Alarm display with help menu. Trend graphs for QA reporting.